In a large bowl, stir the dry ingredients together until blended. Add buttermilk, slightly beaten egg, and shortening; beat by hand until all ingredients are combined. Let batter rest in refrigerator for about 15 minutes before making into pancakes. In a large skillet, heat 1 tsp of cooking oil over medium heat or use a vegetable oil spray to prevent pancakes from sticking. When using the mold, be sure to coat the inside of the mold with oil before setting it into the heated skillet each time and filling with pancake batter. Pour about 1/4 cup of batter in each mold and cook until light golden brown on underneath side. Remove skillet from the heat and carefully remove mold from the pancake, before flipping the pancake over. Then, return skillet and pancake to the burner and finish cooking on other side until bottom side is light golden brown also. Serve warm. If you are making several and want to keep them warm, put the cooked pancakes in a warm oven at 200ºF on a baking sheet until serving time. 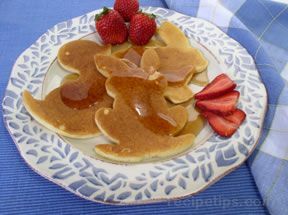 Garnish with fruit as desired and serve syrup to go on top if desired.